King Arthur's Tools have been innovators in producing a range of tools that usually, although not exclusively, centre around the use of an angle grinder. These can include chainsaw-type rotary wheels and tungsten carbide-toothed discs - to name a couple of items - to rapidly but easily shape wood to the desired form. It should come as no surprise that in the search for continual product development, the company has done something a bit different and produced the Holey Galahad range. It is interesting to note that King Arthur's Tools use the names of characters in the Arthurian legends when naming their tools, plus they go a bit further in that the name of the owner is Arthur - anyway all this is an aside! Holey Galahad is a power carving accessory which is a 100mm (4in)diameter dome-shaped disc, with conical-shaped carbide teeth and - here's the new aspect - six holes placed equidistantly around the piece. 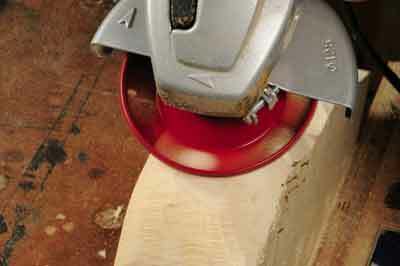 This 'see through' technology allows the carving to be seen behind the disc whilst working. which are in turn, helpfully colour-coded in blue, red and green according to grit. 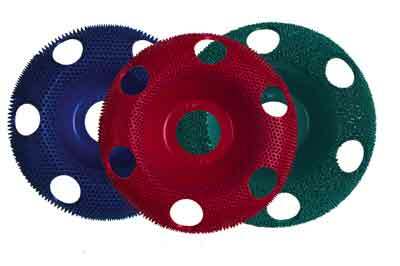 On test the discs cuts very quickly, cleanly and are not prone to as much clogging as the more conventional â€˜solidâ€™ coverage toothed discs. If they do clog, a stiff nylon brush rubbed over the stationary disc soon removes the debris. The holes may not seem a big thing but because of them, you can see where you are working and what you are removing. It is unnerving the first time you look at the work through the disc, but it is brilliant - far better than having to keep stopping and checking the surface all the time. The discs are well balanced, run true on the angle grinder, and do not vibrate unduly in use. The discs performed superbly. Despite being used on a variety of timbers - soft, resinous and dense - no teeth came loose, the colour did not leech onto the timber, and the blade refrained from getting hot with use. Most significantly, a large amount of time was saved by not having to stop the angle grinder every so often to check the surface of the work. These discs really did work well and the see-through holes are an ingenious masterstroke. These are accessories well worth considering for your angle grinder.